The telephone is an amazing piece of technology that has shaped our lives in more ways than we can possibly imagine. It is such a common item today that we barely even think about it - we just take for granted that we will have access to a telephone, either a landline or a mobile phone. I've been thinking a lot recently about how dependent we are on this technology, which has prompted me to create this article on the history of the telephone in the UK. Who invented the telephone? 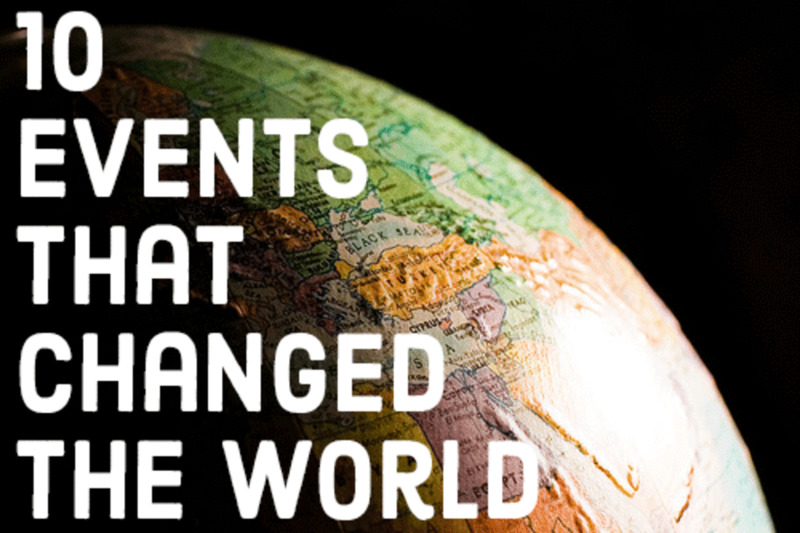 How did the technology develop? When did telephones enter Britain and how quickly did they catch on? Read on to learn more about the fascinating history of the telephone in Britain. The word telephone comes from the two Latin words tele, meaning at a distance, and phonic , referring to sounds. It uses a combination of electricity and acoustics. As children, you probably remember doing the experiment at school with two plastic cups or tins and a piece of string. One person would speak into the cup and the sound would vibrate along the string, reaching the other cup so that the other person could hear it. This is basically how a telephone works. When a person speaks into the mouthpiece, the acoustic sounds will cause vibrations onto a metal plate, or coil, and electrode. The plate will vibrate back and forth, causing voltage to be carried along a set of electric wires, which is then reconverted and amplified into the receiver at the other end. Great introduction to the basics of telephone technology. 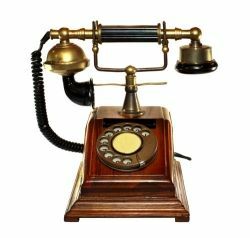 The telephone came into existence in the 1800s - but who first invented the telephone is a question full of controversy! 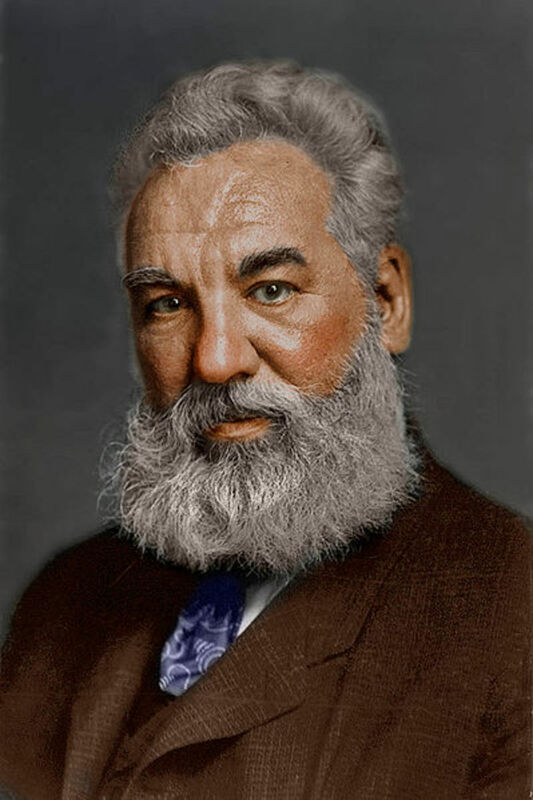 The person who is most widely credited for inventing the telephone is the Scotsman Alexander Graham Bell. Born in Edinburgh, Bell immigrated to Canada in 1870 and then moved to Boston, USA in 1872. 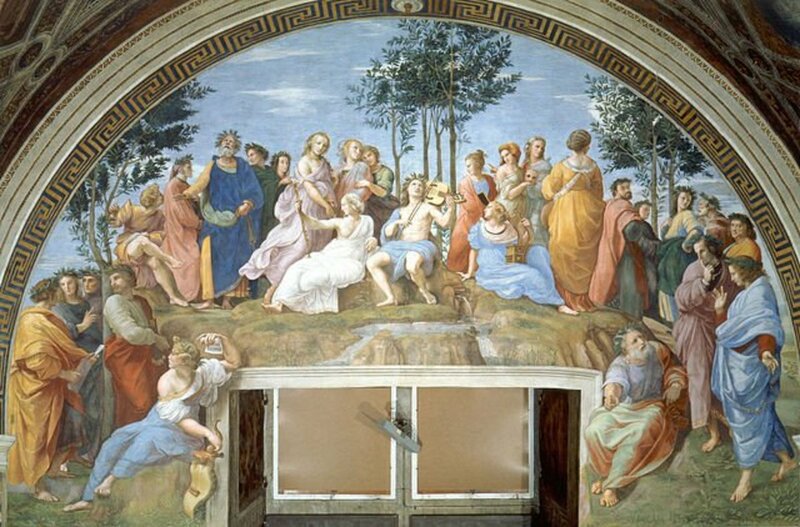 Bell was a teacher for the deaf, which led him to become extremely interested in the production of sounds. This resulted in a study of electricity and magnetism, to see whether sounds could be artificially reproduced. In 1875, Bell constructed his first experimental telephone, with the assistance of Thomas A. Watson. The invention of the telephone mostly occurred through a series of accidents: the first major breakthrough came in June 1875, when Watson accidentally plucked a reed on an acoustic telegraph. Bell heard the sound of the reed from the receiving end of the wire. Bell was then able to create a device which transmitted indistinct sounds, but could not yet transmit clear speech. In 1876, Bell managed to get his telephone design to work, by using a liquid transmitter to stimulate electricity. 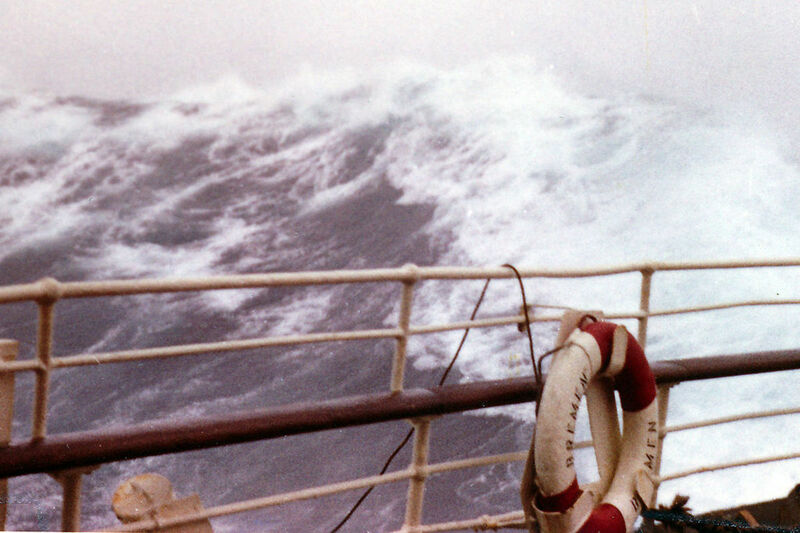 Although the first telephone worked using a liquid transmitter, Bell's subsequent experiments focused on the electromagnetic telephone - the liquid transmitter was never used by Bell again. The first words ever spoken and heard over the telephone were 'Mr. Watson, come here, I want to see you'. Did Bell really invent the telephone? 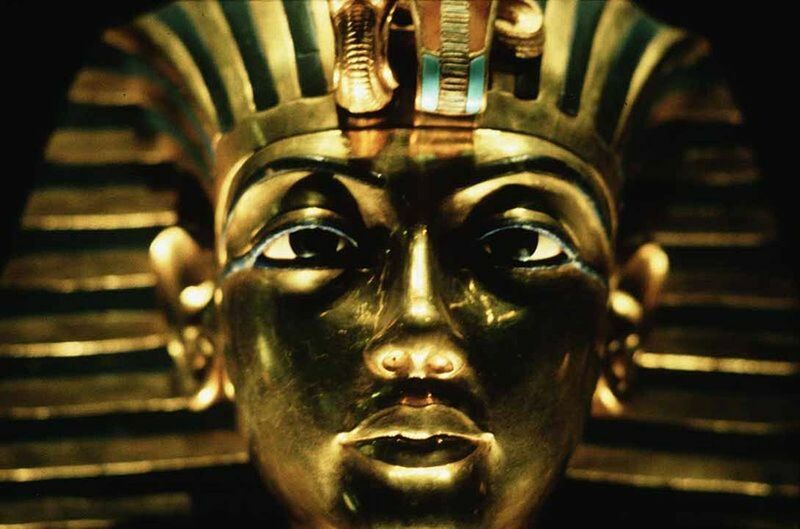 There is much controversy surrounding who really was the first person to invent the telephone. 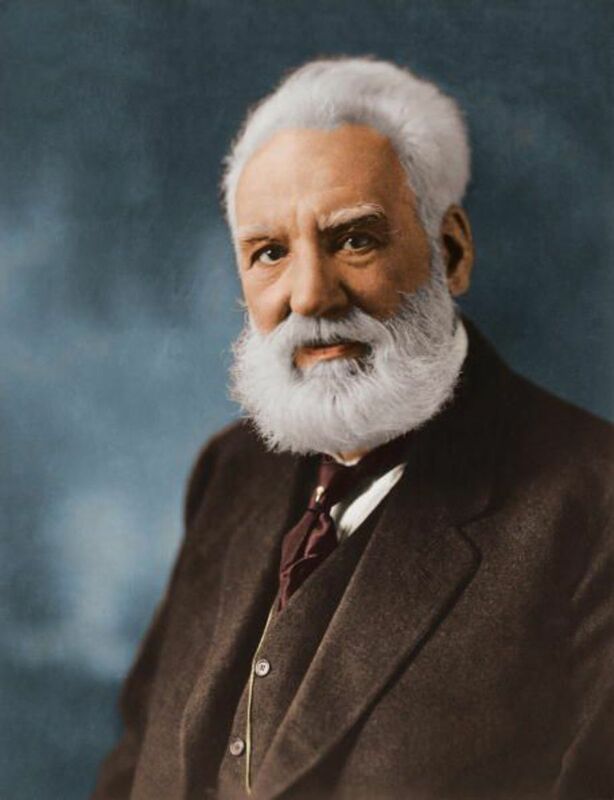 Although Alexander Graham Bell is popularly credited with it, and is probably the name most people would say when asked about the telephone's history, in reality the situation is far more complex. The Italian Innocenzo Manzetti considered the idea of the telephone as early as 1844; similarly, in 1854, the French telegrapher Charles Bourseul published a plan for transmitting speech and sounds through electricity in a Paris magazine. In 1854, Italian Antonio Meucci invented a voice communication device whilst in America; unfortunately, Meucci failed to turn this device into a commercial enterprise. The first person to actually produce a functioning electromagnetic device was Johann Philipp Reis in 1860. Just like Bell's early experiments, the device could transmit indistinct sounds, but could not be relied upon for constant clear sounds or speech. Although this was technically a telephone, it was not at all commercially viable at this stage. Possibly the most famous story associated with the invention of the telephone is the race to the patent office between Alexander Bell and Elisha Gray. Gray was based in Illinois, USA and had been working on a similar telephone device to Bell. In 1876, Gray signed a notarised statement describing a telephone that used a liquid transmitter, and then sent his lawyer to submit it to the US Patent Office. But, a lawyer acting for Bell had submitted Bell's patent for the telephone mere hours earlier! It is still massively disputed as to who really invented the telephone first and whose application reached the patent office first. Bell's lawyers were apparently waiting for Bell's patent to be filed in Britain first, as at the time, patents in Britain could only be registered if they were not patented elsewhere. Rumours abound as to whether Bell's lawyers heard about Gray's invention and rushed to the office to have Bell's invention patented first. Several conspiracy theories also claim that Bell stole Gray's ideas: Bell's lawyers bribed some workers at the patent office to delay the release of Bell's patent for several days, during which time Bell managed to get a hold of Gray's blueprints for the telephone. Bell then submitted a renewed patent with Gray's design, which was issues hours before Gray's. Whoever really first invented the telephone, there is no doubt that it has become one of the most important inventions in history. What do you think? - Did Bell really invent the telephone? Who was really the first person to invent the telephone? How did the telephone make its way to Britain? Although Bell was Scottish by birth, the telephone was first brought to the UK by Sir William Thompson (later known as Lord Kelvin). Thompson presented Bell's telephone at a meeting of the British Association for the Advancement of Science in Glasgow, 1877. Thompson described it as 'the greatest by far of all the marvels of the electric telegraph'. The first pair of telephones had been brought into Britain a few months earlier by WH Preece. Bell himself demonstrated how the telephone worked to Queen Victoria in 1878. Based on the Isle of Wight, Bell demonstrated the telephone through making calls to London, Cowes and Southampton. From then on, the telephone began to make headway as a key feature of British life. After Bell's demonstration, the Telephone Company Ltd was formed specifically for marketing Bell's patented telephones in Britain. It had a capacity for 150 separate phone lines and opened with approximately 8 subscribers. From the late 1870s onwards, the telephone slowly began to expand into a key invention in British life. Long distance telephone trials took place between London and Norwich, proving that the telephone would be viable as a method of communication. In the mean time, the technology behind the telephone was constantly improving: the initial transmitter developed by Bell was replaced by an electromagnetic transmitter developed by Thomas Edison. This was then superseded by a new transmitter invented by Francis Blake. Blake's transmitter was based on Professor David Hughes' experiments with the microphone, meaning that the overall sound quality in the telephone would be improved. Bell's various telephone companies began to use the Blake transmitter for the next 20 years. In January 1880, the first trunk line was opened, between Leeds and Bradford in West Yorkshire. The development of the trunk line meant that a circuit connected the two telephone switchboards in Leeds and Bradford, thereby allowing access to several extension lines at once. This was a method that would eventually be repeated across the country. The development of central batteries by G.L Anders in 1882 ensured that telephones could all be supplied with electricity from a central source, eliminating the need for batteries at each individual telephone. This technology gradually replaced individual batteries throughout the UK, however it took almost thirty years for central battery exchanges to become the norm. 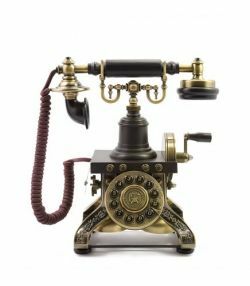 At this point, the telephone was primarily seen as a business tool, with emerging industries and companies hoping to improve their communications. The idea of the telephone as a private possession did not occur until the 1900s, and it was several decades before the telephone in the house became a common phenomenon in the UK. How did the telephone system work? 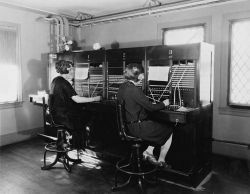 Before the invention of automatic telephone exchanges, the assistance of a telephone operator was required to connect the two telephone lines. 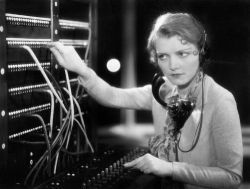 The caller would speak to an operator at the central telephone exchange, who would connect a cord to the correct circuit in order to complete the call. When telephone exchanges were first established, the companies primarily employed men to act as the operators. 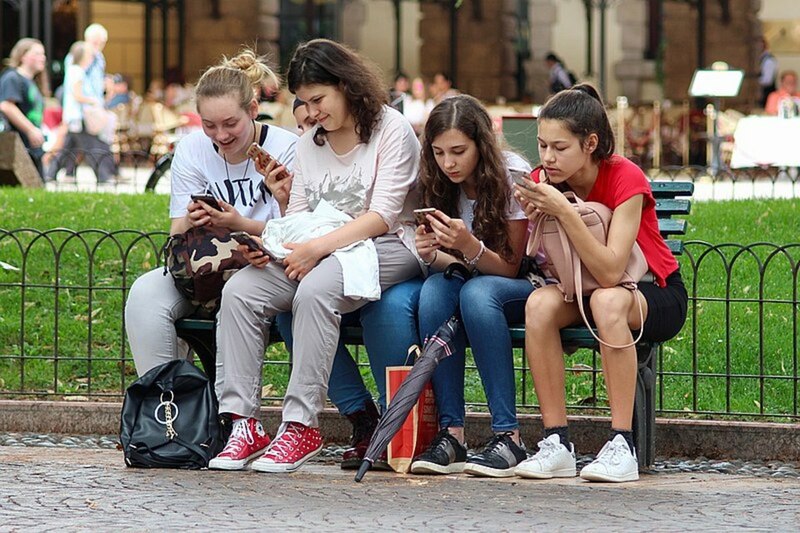 However, many of the young boys initially employed proved to be untrustworthy, likely to play pranks whilst on the phone and not connecting the phone lines correctly. This resulted in the telephone becoming one of the first businesses to extensively employ women. In America, Emma Nutt became the world's first female operator, working at the telephone exchange in Boston. Customers were reported to have been so pleased by Nutt's voice that over time, the phone operating profession became strictly women-only. This was a process repeated in Britain, as women's voices were regarded to be more soothing and calm than men's. Female bluestocking employment in telephone companies soared, particularly during the First World War. This was an important step in the history of female employment as it demonstrated women were equally capable of secretarial duties as men. Although Bell had the ultimate patent rights to the telephone, the Telephone Company Ltd began to face serious competition in Britain. In 1879, the company had opened several more exchanges: two more in London, and then several in major cities across Britain, such as Glasgow, Edinburgh, Birmingham, Liverpool and Bristol. 1879, however, also saw the establishment of the Edison Telephone Company of London Ltd . After 6 months of operation, Edison's company was serving 172 subscribers. Edison's company was initially far more popular than Bell's as it was cheaper to use: the annual tariff was Â£12 for an Edison line, whereas a Bell line cost Â£20. Up until 1880, private companies could all operate without restriction in Britain. A landmark judgement in 1880, however, effectively reined in the telephone companies and gave supremacy to the Post Office with regard to telephones. In December 1880, a court judgement was issued that stated that a telephone was a telegraph and a telephone conversation was a telegram. As the Post Office held the monopoly in Britain on telegram services, all private telephone companies were required to obtain a 31 year license from the Postmaster General in order to carry on operating. The Post Office would then take 10% of the companies' income. From this point onwards, the Post Office had an effective monopoly over the telephone. The Postmaster General decided to restrict private company systems to the areas in which they were already operating, so that the Post Office could expand telephone availability into other areas of the country. The court ruling, combined with debates over patent rights, prompted Bell's and Edison's telephone companies to amalgamate, forming the United Telephone Company. The Post Office decided to take advantage of the court ruling and in 1881 began to convert some of its telegraph exchanges so that they could be used as telephone exchanges. This first occurred in the Welsh industrial cities of Swansea, Newport and Cardiff, followed by other major industrial ports such as Newcastle-upon Tyne and Middlesbrough. Although the Post Office effectively had a monopoly on the telephone system, private companies could still flourish under the Post Office umbrella. Hence the formation of the National Telephone Company in 1881 to exploit the market in the Midlands and Scotland, and the Lancashire and Cheshire Telephonic Exchange Companies . This monopoly of the Post Office was somewhat reversed in 1882, when the Postmaster General, Henry Fawcett, decided that any responsible person or company could be granted a license to operate a telephone system, even if they wished to establish a company where a Post Office system already existed. This reflected the capitalist industrial view of the time, where competition was seen as the best way to create superior industries. This liberalisation of the telephone industry allowed the development of the public call office. Up until 1884, the use of telephones had been primarily confined to businesses and industries, with extremely little use in a private capacity. The public call office, however, meant that, theoretically, anyone could have access to a telephone. Public call offices were set up in public places such as railway stations and general stores. Again, this decision was taken by the Post Office, showing how it was still the most powerful player in the telephone business. The call office would later evolve to become the iconic red telephone box. The telephone systems across Britain became more developed and more complex throughout the 1890s, culminating in the 1899 Telegraph Act which allowed local authorities outside of London to establish their own local telephone systems. It was hoped that this would establish competition between the National Telephone Company and local entrepreneurs. The plan however was not as successful as the government would have wishes. There were 1,334 urban local authorities that could have sought licenses, however only 13 asked for licenses, and only 6 actually managed to open their own local telephone systems. The turn of the 20th century saw great advances with regard to the telephone system. In 1901, an agreement between the Post Office and the National Telephone Company allowed free intercommunication between the two systems in London. This meant that companies registered with the Post Office could ring National Telephone Company lines and vice versa. From 1905 onwards, the two companies began their plan of unifying the two systems, in order to provide a coherent and synchronised telephone system. Government interest in the telephone system had been growing throughout the last two decades of the 19th century, and in 1905 the Treasury and the War Office had both subscribed to the Post Office's London Telephone Exchange. Growing demand from government departments and London businesses led to the installation of a new common battery exchange in 1906. This had a capacity of 150,000 lines. This 'city' exchange was officially opened in 1907. By 1912, there were seven separate private phone companies operating throughout Britain. However, the Post Office at this point took over the National Telephone Company's system (the largest competitor), meaning that there existed a unified telephone system throughout most of Britain for the first time. Remaining municipal systems existed in Hull, Portsmouth and the island of Guernsey, however, the Post Office in this year took over all other private telephone companies that had sprung up throughout the country. The period between 1912 and 1914 is regarded as a pivotal one with regard to telephone development in Britain. As relations with Germany became ever more strained and with the prospect of war looking more and more likely, it was vital that Britain had a fully fledged and sophisticated telephone network to make communication easier. It was also during this period that telephones began to make their way into more and more private homes. 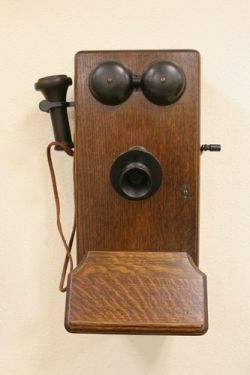 Many industrial tycoons had already had private telephones installed, to better keep up with their businesses, however 1912 onwards saw many of the aristocracy and gentry have telephones installed. This was a change that would continue to occur over the next twenty years. The phone network was growing and developing all the time, and between 1912 and 1914 a series of trunk exchanges were established, to enable better communication between the larger cities. The trunk lines were developed in a variety of ways, with some using telegraph lines, others in underground cables and many on overhead routes. This paved the way for Britain's central telephone infrastructure, much of which is still in use today. With the outbreak of war in 1914, excellent communications were vital. The government commissioned the expansion of the telephone underground cable network in 1914, ensuring that different areas of the country could be reached at a moment's notice. This developing technology would improve throughout the war period and in to the 1920s. Timeline charting the development of the telephone in the UK, courtesy of British Telecom. Further information on the Bell-Gray telephone controversy. A short account of the history of female telephone operators, with a special focus on Emma Nutt, the world's first female operator. I need to find out what sort of phone a middle class home might have had installed in southern Britain. 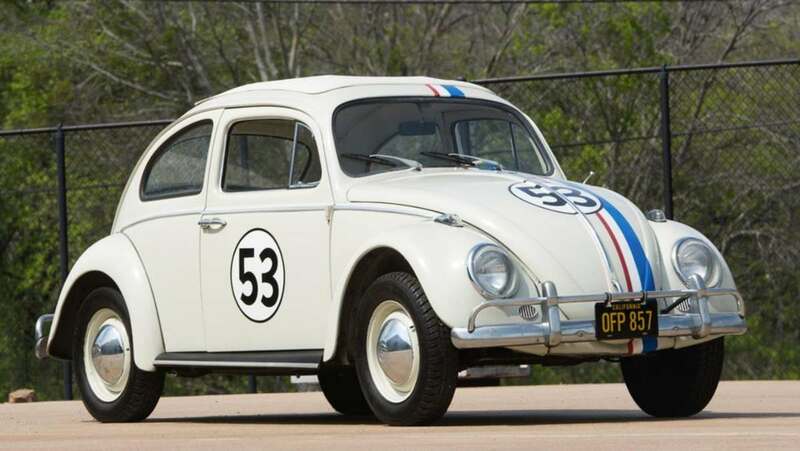 Any images available? Would it have been a self-dialling system or routed through a manned exchange? When did phone directories come in? I didn't know Alexander Graham Bell taught the deaf and I enjoyed the trip back to the central telephone exchange. I grew up so deep in the sticks that this was how we communicated and no! it actually wasn't that long ago. Blessings. It's so fascinating for me to read this because in a previous life I used to work for Plessey Telecommunications which made telephone exchange systems. Great overview about UK telephone system! You can learn a lot about it from this lens!